Let’s look at what happens if you try to serve HLS from two WSE servers that are both ingesting the same live RTMP stream. Eventually, your client will ask one of the servers for a chunk that is not yet ready on that server. To understand this, you can look at a specific sequence of events that might happen in the middle of a streaming session. Suppose we have two WSE instances, “Server A” and “Server B”. Both are relaying a live stream from the same liveorigin WSE instance. This session has already been in progress for a while; the client has already made multiple requests for updated chunk lists, pulled multiple chunk files, and played back a number of them. In order to provide a stable stream, we need to make sure that once a client connects to a live stream, it stays with a single server. We do this with a little bit of DNS magic mixed with a little intelligence in the application load balancer. Here’s a diagram showing the general architecture. The Wowza ingress servers receive the live stream from the video encoders, and then they repeat out to the Wowza HLS servers. An ALB balances the traffic across the two HLS servers, and CloudFront sits in front of that, delivering playlists, chunklists, and chunk files to your end users. It’s always a good idea to put your servers into auto-scaling groups. Even if you don’t need to scale up and down, an auto-scaling group can ensure that you always have at least one instance running for a particular function. Define two single-host autoscaling groups (min = 1, max = 1, desired = 1) for your HLS servers. Put each in a private subnet in separate availability zones. Each autoscaling group needs a launch configuration that uses the Wowza AMI and has a userdata script that will configure WSE so that they have different hostnames. We’ll get to the Wowza config shortly, so you can come back around to set up the userdata later. For now, use the official Wowza AMI appropriate for your licensing. There are a number of key configurations you need to make to your WSE application. The Wowza documentation will tell you about configuring a server as an HTTP caching origin, and that’s a good start. But their techniques alone won’t be enough to let you run a multi-instance cluster without live stream stability problems. Configure your RTMP ingress servers to receive an incoming live stream, and configure your HLS servers to point to those origin servers. Wowza provides documentation for this. Note: the HLS server in AZ1 should list the AZ1 ingress server first, and the HLS server in AZ2 should list the AZ2 ingress server first to minimize the amount of inter-AZ traffic, which does have an associated cost in AWS. The server in AZ1 should have a cupertinoPlaylistHostDomain value of media-hls-az1.example.com and the server in AZ2 should have a value of media-hls-az2.example.com. This makes sure that every URL output by server X during an HLS session is fully qualified and will cause the ALB to route subsequent requests back to it (or to CloudFront cached content that originated with server X.
CloudFront allows your HLS streaming servers to scale more or less infinitely. Very little traffic will come back to your Wowza servers, so the fact that you have just two instances doesn’t matter. CloudFront will do the heavy lifting. As your traffic grows, CloudFront will absorb a higher and higher percentage of the requests, keeping the load essentially constant on your Wowza servers. 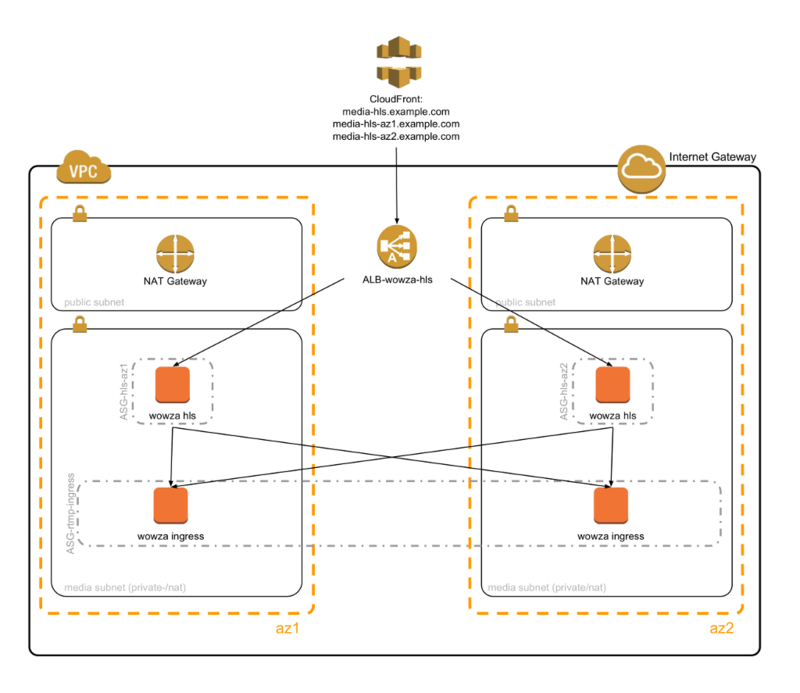 Set the origin of the CloudFront distribution to your ALB. This makes sure that the CloudFront distribution can handle requests for any of these three hostnames. We will start users with a media-hls.example.com playlist URL, and if it’s a cache miss, the ALB will route that request to one of the two Wowza servers. That server will respond with a playlist that uses an absolute chunklist URL to make sure the next request comes back to the same server. The chunklist will in turn contain absolute URLs to the chunk files, keeping all of those requests on the same server. And what if it’s not a cache miss? We’ve got that covered. Passes the host header through to the ALB, which allows the ALB to route cache misses for chunklists and chunk files to the appropriate target group. Factors the Host header into the caching key, so that chunklist.m3u8 from media-hls-az1 isn’t “mixed up” with the chunklist.m3u8 from media-hls-az2. Two separate chunklist.m3u8 files will be cached, and depending on the Host header presented by the client, the appropriate file will be returned, keeping the streaming session stable. You should see your live stream, and if you are able to monitor the network traffic (like with VideoJS HLS), you’ll see that after the initial request for playlist.m3u8, all your requests will either go to wowza-hls-az1 or wowza-hls-az2, resulting in a highly stable stream. If your encoder supports it, you could have it encode to HLS and send the chunklist and chunk files directly to S3, and let CloudFront serve directly from S3. This is a little added complexity on the encoder end, but it pays off with reduced complexity in the serving stack. You might consider trying to use sticky sessions that are cookie-based. In order to do this, you have to use a classic ELB, not an application load balancer. You can add a custom plugin to Wowza Streaming Engine that will generate a cookie suitable for an ALB sticky session. But the big caveat is that you might require special configuration of your HLS player to allow it to pass cookies (many do not pass them by default). Even worse, some players will not pass cookies at all, so if you need broad accessibility of your HLS streams, this solution is not going to be for you.